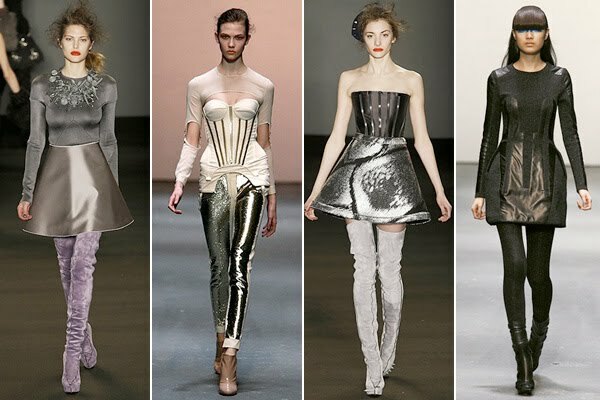 Visions of the future are often associated with the advancement of industry and technology, which is why metallic fashion items are frequently featured in the new futuristic trend you see all over the fashion world today. Leather, fur, feathers and bold cuts are other elements of futuristic fashion that move your look beyond modern trends. Lady Gaga is one fashion icon that perfectly exemplifies this futuristic style, but don't worry: you don't have to wear a dress made out of meat just to be edgy. To adopt this truly fashion-forward style in a practical way, read on for four tips that will zap your wardrobe into the future. What could be more shiny and metallic than mirrors? These reflective pieces are quickly becoming incorporated into different jewelry items, which make them the ultimate versatile accessory because they literally reflect the color and style of your environment perfectly. One cute way to embrace futuristic mirror accessories in your wardrobe is with a cool mirrored necklace or pair of earrings to add a psychedelic accent to any outfit. From daring maroon leather jackets to skin-tight black leather pants, this season is all about getting in touch with your sassy side by slipping into this bold material. Leather is simple enough to easily mix and match with the rest of your clothing, but also edgy enough to make you stand out from the crowd. If you're not feeling fierce enough to pull off this look just yet, start off small with a classic black leather mini to add a subtler shine to your outfit. Although the name connotes a more innocent image, Peter Pan collars can add a touch of feisty color and flavor to your outfit that goes beyond modern styles. Embellished collars especially are a great way to give your outfit a futuristic feel, since these collars typically feature sparkling jewels, sequins and other three-dimensional accents that create texture and immediately draw attention. Broad shoulders might seem like a very unfeminine fashion statement, but actually this look can add refinement and class to any outfit. Celebrities like Kate Moss, Beyonce, Miley Cyrus and Brandy have already embraced this futuristic look, while still maintaining a stunning feminine air. When worn in this fashionable way, extra shoulder padding can even flatter your waistline by creating the appearance of a more dramatic dip. One of the best things about fashion is that you don't have to be stuck with today's trends when composing your own original style. Many fashion experts look to the past for ideas, but you can just as easily look to the future to apply your imagination and creativity to the art of fashion. When you take on this futuristic trend, you can count on being ahead of the times in the fashion world, while embodying an aura of mystery that will give your wardrobe that unique edge.